Baking is an ancient art of cooking that uses dry heat in an enclosed space to cook food so that it retains its benefits and enhances the flavors. In common parlance, when one uses the term “Baking”, they refer to breads and desserts, but that is a myth because wide variety of vegetables, fruits and grains can be baked to make excellent dishes. In the modern day, baking is usually done in an Oven. These ovens can either be electric ovens, wood or gas. Many of these modern day ovens also have tools for grilling and broiling inbuilt which are also cooking methods that require dry heat. Baking is considered to be one of the healthier cooking methods as it requires little or no oil. Due to this, the vegetables being baked retain their natural flavor as they get cooked in their own oil. 1. Time and temperature: The key thing to remember while baking is that the baking time and temperature will determine how your food will turn out. This will always depend on the size of your dish or its weight. For example if your dish is very dense and large, it will take longer to cook. 2. Pre-heating the oven: This simply means keeping your oven ready at the required temperature you want to cook your food at. Firstly, preheating your oven saves up on your actual cooking time as the oven is hot already. Secondly, a lot of times food is cooked unevenly due to uneven heating of the oven. To avoid such complications, pre-heating is a must. 3. Always make sure to use oven mittens or a thick folded cloth to remove the baked food out of the oven. 4. If you are baking breads, cookies or other desserts, make sure you allow it to rest before slicing or consuming. For example, cookies eaten straight from the oven will be soft and will lack the crunch and texture. Here are a few baked vegetarian dishes that are super fun to make. Craving for a lovely dessert post dinner or trying to serenade a loved a one? Try baking these scrumptious desserts. The variety of baked desserts is endless but one of the most loved one is a basic sponge cake. A springy, sweet, soft cake that can be molded into different shapes and can also be made in exciting flavors like a rich vanilla sponge cake, tropical Pineapple sponge cake and chocolate. A chocolate and vanilla cookie is loved by kids and adults alike. The buttery cookies are baked to perfection using a concoction of butter, condensed milk, sugar and flour. Serve it with warm milk, as a snack or a post dinner dessert, after all chocolate cookies never disappoint. This is a lusciously spongy cake with delicious aroma of condensed milk and vanilla, and is alternated with portions of rich dark chocolate cake. A creamy and delicious concoction of paneer, dahi, sugar and lemon which can either be eaten as lemon curd or a tart. The zingy and sweet dessert can be made even more fun with to eat by adding whipped cream or jelly on top. This brilliant creation is buttery, soft and filled with cinnamon which is a beautiful spice in itself. You can eat this when you are tired of your usual desserts and it doesn’t even take up a lot of time. This amazing dessert is a kids and adult favorite vegetarian dessert recipe. Ever had a craving for something junk but skipped out on it because it’s unhealthy? There are a lot of ways where you can get the same taste and still have it be healthy! You can bake brown bread to use for a sandwich or make Baked Chaklis for shaam ka nashta. Here are a few simple healthy baked recipes you can make to satiate your cravings. A vada pav with a surprise! A soft bread roll filled with garlic chutney and a spicy potato to mixture to make the ultimate vada pav. It tastes delectable in every bite you take. Have it alone or invite some friends over but we are sure you will have no leftovers. A much healthier option than the store bought pizza base, this recipe takes less than 20 minutes to make. It is delectable, healthy and to have some fun, you can shape it into any shape you like. With only 2 minutes of actual hands-on work, this recipe is so addictive that you will never go back to the store bought bases. Bread Samosa Recipe This samosa is made with brown bread and a potato mixture. Even though it takes a little time to bake, it is definitely worth the effort you put in. Savour these warm samosas green chutney, imli chutney or ketchup. A lot of people cook under the impression that Indian food does not require baking, which is not true at all! Till and Jowar Puris can be baked easily which makes it a much healthier recipe than the fried ones or you can go for the baked cheese rolls which oozes out cheese on eating. 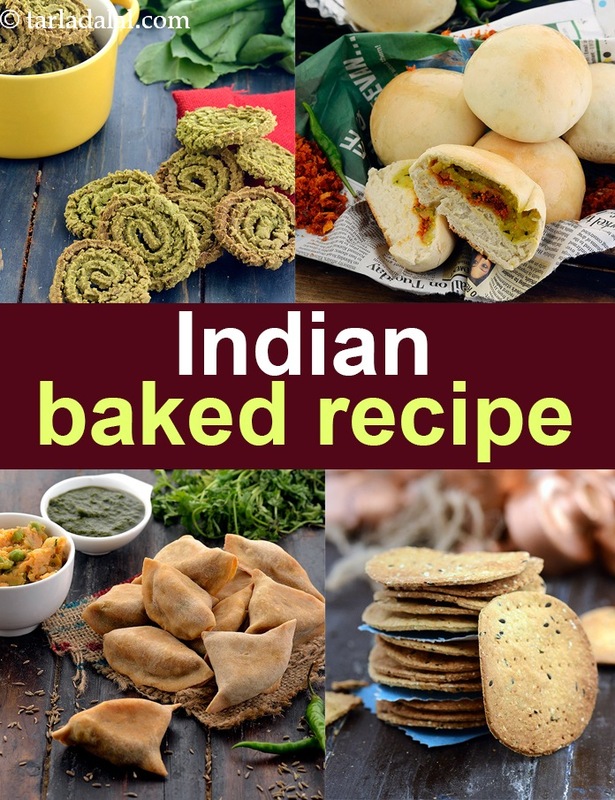 Here are few recipes that provide an Indian touch to your favorite food. These crispy, light crackers are served with a cool cucumber dip and make for a perfect snack for the summers. It is also a very good way into making your kids eat healthy grains like Ragi and oats. Since they are easily stored, you can make a large batch at one time and store it in an airtight container. A quick recipe that can be made anytime, either for Breakfast or as an evening snack. The creamy spinach, with the addition of simple ingredients like chopped onions and green chillies, lifts a simple toast bread to a delectable dish! A street side favorite dish turned into a fusion Italian delicacy, it should be a must try on everyones list. This amazing dish is definitely a fan favorite and will leave your family and friends wanting for more. So simple and yet so drool drool worthy, these recipes are so popular that you will never have enough of them. May be it be puff or a risotto, you will savour them in every bite. These fries are a much healthier alternative to the regular fries we are so accustomed to eating. Made with pumpkin, which provides a sweet touch to the classic, they are tossed in olive oil and baked to perfection. The pesto pizza sauce is a more garlicky and rustic one compared to the regular Pizza sauce. Combine it with some bell peppers, zucchini and cheese and you have a winner. This is a soft, fluffy bread that can be eaten alone, with jam and butter or with soups like Corn, Basil and Fusilli Soup. Once you make this, your kitchen will smell like the inside of a bakery and that smell is so addictive that you will want to back to it again and again. There is not one person who does not like gorging on freshly baked savoury food. Whether it’s soft paneer in white sauce or a classic open corn toast, you will definitely not want to wait for them to cool before you dive in. You can try these new and exciting recipes for your next meal! A rich, creamy risotto stuffed into a bell pepper to make you a one of a kind meal. Since it is so colorful and lusciously rich, it makes this dish a favorite for the kids. A perfect blend of tangy tomato sauce with hints of coconut makes eating vegetables far more exciting than usual. The addition of raisins (kismis) and cashews (kaju) adds a bit of sweetness and crunch to the already appetizing dish. Khamiri rotis are the Mughal’s answer to leavened flatbread. They are spongy, soft and extremely unique in taste as they have a slight tangy taste. You can have it with a sabzi like Lajjatdar paneer or make it into a kebab.